Todays world is all about sharing our through social network like Facebook, Twitter and Snapchat which has become normal, it makes sense that smart phone use at weddings is common. 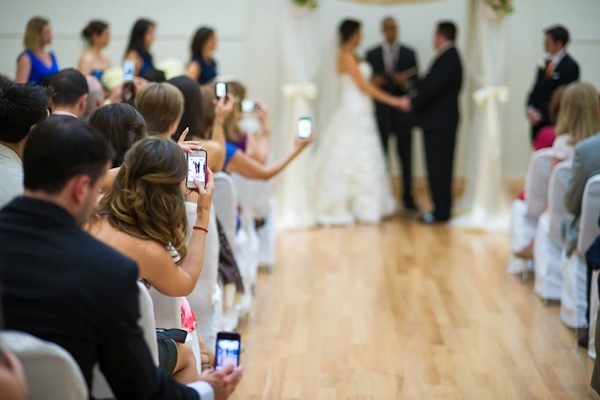 Unfortunately, the use of phones during this big celebration will take away from everyone’s presence and more likely, it may ruin some otherwise great shots your wedding photographer captured. Now a days, some couples opt for a dslr / smart / cell phone-free celebration. If you don’t want phones getting in the way of your big day, here’s your guide to pulling off an unplugged wedding. An unplugged wedding is when you ask all your friends, family and guests to turn off their phones, ipads, cameras and other digital distractions during the wedding ceremony, reception or sangeet. The main purpose is to allow the hired wedding photographer the chance to capture the your precious moments / wedding as efficiently and flawlessly as possible without possibly missing key shots caused by obtrusive photographer friend / guest photographers. Would this be anywhere close to possible in Our Indian weddings ? Yes, I would agree it would be definitely hard but it is possible. It depends how you want to tell each one to focus on enjoy your union. I shoot anywhere close to 3000/3500 per wedding, but many time we miss many shots due to these so called “photographers” asking the wedding couple to look at the them. Question is why encourage if you hire a pro photographer already ? Defiantly you would hire a pro wedding photographer who would shoot wonderful photos which is of him/her primary focus. All these images won’t better quality than a on phone camera or guest photographer. And you would be more likely distracted, we(photographer) would miss the shots or you would be looking else where in the shot which your actual photographer take, which doesn’t make a perfect photo either. Would it be even worth taking ? 9.5 out of 10 times the answer is No. (I am leaving out that ‘0.5’ chance if in case the photographer isn’t available at right moment you could) Most of us know these photos would even come blurry or dark or someones face/body are cropped. Nightmare Bride & Groom ! Generally our wedding ceremonies are close to 4 hours and some weddings run upto 9hours adding to bride prep. it would be averaging upto 6 to 12hours. So imaging the strain and stress a bride or groom who undergo in these hours, a guest asking you to take selfie or asking you to pose / even smile for their camera, is going to crazy hard. This not only take away your valuable energy but also your precious time at the wedding. Having a Unplugged Wedding Theme is possible and one of the best way you can enjoy your weddings. There are many ways to approach the announcement of your unplugged wedding theme. For instance, you can mention it in your wedding invitation. You can mention your no-camera / no-phone rule in a playful way, with a cartoon sketch or creative fun fonts. If you don’t want to include it in the main invitation, you can mention the note in the RSVP instead. Explaining why you prefer your wedding to be unplugged, mentioning the benefit of having everyone be completely present. Make it very clear that you know your guests want wedding photos and that your wonderful trustee photographer will capture great shots of everyone. You want to encourage your guests to participate, not force them to. Definitely i can be writing forever in detail but you get my point.We want you to enjoy your wedding day to the maximum, leaving the rest to us !